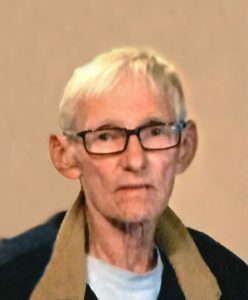 Larry "Dusty" Ladwig, 71, of Schuyler, died Monday, October 29, 2018, at the CHI Memorial Hospital in Schuyler. Mass of Christian Burial Monday, November 5, 2018 10:30 A.M.
Larry R. Ladwig was born February 1, 1947, in Columbus to Eldon and Mary (Dvorak) Ladwig. He attended Schuyler Schools and graduated from Schuyler High School. He then entered the United States Navy. Following his service to the country, Dusty was a lifelong truck driver. On November 12, 1976, he married Ann Svec. They lived in Schuyler and Dusty drove many years for GM Express. He was an avid Nascar fan(go Martin Truex), tinkered in woodworking and is well know for his 3 old vans, each unique, he could be seen driving around Schuyler. He complained about his "four-legged" friends but Tinker, Jake and Simba were true friends. Dusty and Ann enjoyed cruise ship vacations and traveled many miles on the bike. He enjoyed ship reunions and had just attended his last one in September. Above all, Dusty was a grandpa who loved all the time he spent with his grandkids. He loved the smiles on their faces when he was around them. Dusty is survived by his wife, Ann, of Schuyler, two sons; Jacob(Kristina) Ladwig, Columbus and Brad and special friend Sheila Trainer of Schuyler, two brothers; Raymond (Linda) Ladwig, Schuyler and Dwaine (Michelle) Ladwig, Shelby, three sisters; Mary Ann Shonka, Schuyler, Carolyn Rees of Parker, Colorado, Sharon (Randy) Tomasek, Schuyler, sister-in-law Renee (Doug) Blum, Schuyler and brother John (Deb) Svec of David City, six grandchildren; Brayden Hitchler, Tyler Kramar, Riley Ladwig, Kirsten Ladwig, Avery Ladwig and Katelyn Ladwig, as well as several nieces and nephews. He was preceded in death by his parents, EC and Mary Ladwig, in laws Emil and Shirley Svec, brother and sister-in-law, LaVern "Butch" and Ann Ladwig, nephew John Ladwig, two brothers-in-law; Kenneth Shonka and Rocky Fletcher.